Introduction of exotic natural enemies for biological control of invasive pests may disrupt existing ecological interactions, which may influence the outcome of biological control introductions. 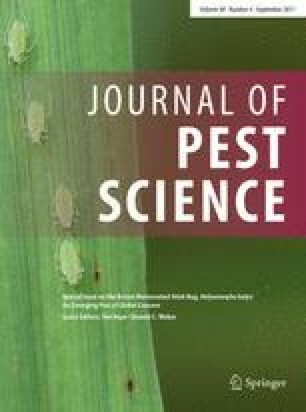 The interactions between Asian egg parasitoids, proposed as classical biological control agents of the highly polyphagous invasive pest Halyomorpha halys (Stål), and parasitoids native to the introduced area are largely unknown. Therefore, adult and larval interspecific competition between the exotic Trissolcus japonicus (Ashmead) and the European Anastatus bifasciatus (Geoffroy) was assessed (1) by observing aggressive interactions between adults of the two species following parasitization and (2) by providing each parasitoid species with previously parasitized H. halys egg masses at various time intervals. The results suggest that T. japonicus and A. bifasciatus engage in counterbalance competition, with the former being a superior extrinsic competitor (egg guarding and aggressiveness) and the latter being a superior intrinsic competitor (successful development from multiparasitized eggs of all ages). We suggest that the presence of T. japonicus is unlikely to have a negative impact on A. bifasciatus, and that those two species can coexist and potentially act synergistically in the biological control of H. halys. This work was funded by NSERC PGS Scholarship and ESC Research Travel Scholarship to JKK, and Agriculture and Agri-Food Canada A-base funds to TDG. We would like to thank Elijah Talamas (Smithsonian Institution, Washington, DC, USA) and Lucian Fusu (University of Iasi, Romania) for the identification of the parasitoids from our laboratory colonies. The authors are grateful to Serge Fischer (Agroscope Changins-Wädenswil) for providing the original A. bifasciatus colony.